Collido_scope is an urban installation composed of five principle scenes, each constituted of a series of photographs. In total it contains just over 700 individual images which exist together in a state of permanent fusion. Two further scenes incorporate the installation's dream state. The work explores the urban identity, the sense of place of the town of Issy-les-Moulineaux, via the juxtaposition of this multitude of images photographed, for the most part, in the vicinity of the town hall and market, where Collido_scope was to be exhibited. The images form an ever-changing collage, driven by interaction with its spectators and with its sound environment. 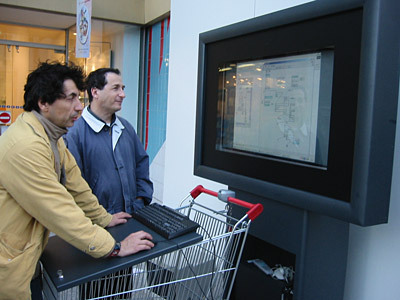 The latter is a function of the installation’s location - during 1er Contact, a broad pavement in front of a supermarket - the Monoprix - opposite the town hall across a busy street. 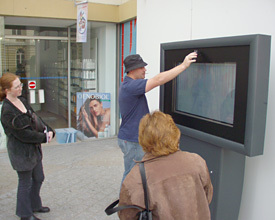 The picture provides a stage for the daily comings and goings of the town’s inhabitants and visitors, creating a visual poem in a state of permanent recomposition via infinite superpositions of individual images. Located in a public space, the principle of Collido_scope is to construct an ongoing relationship with its spectators-passers by, who see a different aspect or view of the work each time round. Collido_scope attempts to metamorphose (and to "detyrannize") the “immortalised photographic instant” by opening its arms to a multitude of moments, a sort of temporal and spatial reconstitution allowing the the urban investiture of place by the town’s people to be materialised. Though the artistic imperative of photographing people at such close range shows a lack of courtesy, the treatment of each individual, within the ceaseless flow of humanity, is at the service of their innate dignity. The generation of such an unexpected, impossible, disarranged sequence of views gives the town's inhabitants a means to decode and emotionalise the sense of place and subconscious of their environment. Three of the scenes concern the town centre: in the first, the reflecting facade of the Monoprix supermarket itself, and the fresco in front of which the installation was located; in the second, a view of the same pavement from above, in the rain with umbrellas (parapluies in French); in the third, four points of view from the interior of the same bistro, called Les Colonnes, which faces the market square and the town hall. 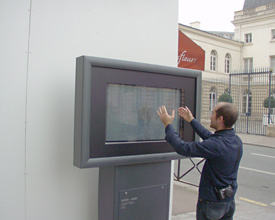 The fourth scene, more rested, less urban, was photographed in the Saint Germain park on an island in the Seine at the bottom end of Issy. The fifth scene is of a lake - called Greziolles - in the Pyrenees Mountains, at the other end of France, on the Spanish border - this is for when the town dreams at night... A sixth scene is composed of different views of Issy at night, and a seventh called “of victuals and hands”, was photographed in the town’s Friday market. These last two scenes appear in conjunction with the lake. The relationship between all the scenes is shown in the structural diagram. The five principle scenes function mainly autonomously, or occasionally together. In the first case, a dynamic collage is built up from images from the current scene, according to its specific set of rules. In the second case, a more tumultuous collage occurs between images from two scenes, as one passes from one to the other. In “philharmonic” terms, the scenes can be considered like musical movements. Each has its own nature and structure, but they are bound together via a series of geometrical congruencies at the compositional level. Thus the points of view for the photographs were chosen to incorporate elements of symmetry and strong geometrical sub-divisions. Certain scenes are divided into two halves vertically - Monoprix, Les Colonnes, Saint Germain - or horizontally - Les Colonnes with the balustrades on the pavement edge, the path in Saint Germain. Further subdivisions – the rhythmic window frames in Les Colonnes - reinforce this. They also contain clearly affirmed diagonals - Umbrellas with its pavement, Monoprix with the fresco, Les Colonnes with the perspectives of the buildings opposite. Reflection also plays a role in the geometrical construction - the glass facade in Monoprix, optical effects through the combination of points of view in Les Colonnes, and the lake in Greziolles. Texture plays a role, via the paving in certain scenes - Monoprix, Umbrellas, Saint Germain. Collido_scope interacts with its its audience and its surrounding environment via a sound interface. Thus the juxtaposition of images is harmonic or chaotic, depending on the level of noise coming from the environment. 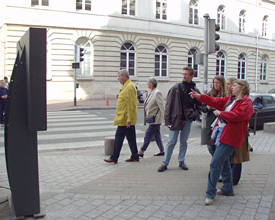 During 1er Contact the installation was located next to a traffic light, so the acceleration of vehicles at regular intervals, whenever the lights turned green provided a rhythmic surge of noise which would set the picture off. Similarly, heavy traffic, or a single, loud vehicle passing by would have a direct effect: in these cases, the scenes would mix, and the previous scene would be replaced by a new one. The work functions differently during the day and the night. During the day, the Monoprix fresco forms the primary scene, while during the night, much calmer, the Greziolles lake takes over. 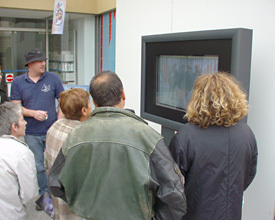 The audience interacts with the work by clapping. A single clap corresponds to a mouse click, which has a specific effect depending on the particular scene being displayed at that moment. There is a “double clap”, which causes the scene to be replaced by a new one. Clapping at regular intervals "hypnotises" Collido_scope by putting it to sleep - signified by the appearance of the scene of the lake allowing spectators to briefly simulate night-time conditions during the day.